Free online ordering website designed around your restaurant’s brand. Connects your storefront to business online, growing your customer base and encouraging customer loyalty. Competitive flat fee model easily allows the consumer to absorb the cost, making Menufy a free service to your restaurant. 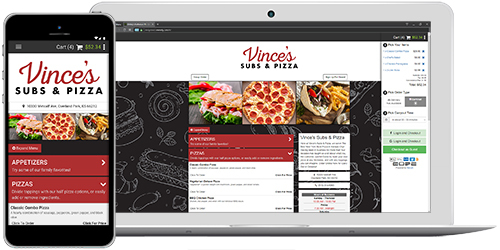 Menufy designs a free eCommerce website, with a digital menu from which your customers can place takeout orders. Online payment can be made via credit card, Apple Pay, PayPal, Venmo, Bitcoin, and more. The website is listed on the menufy.com portal and mobile app, for local discovery. Each restaurant is then promoted online through Google and other web directories. A flat $1.50 per online order paid by the customer. Restaurants may choose to split the cost with the customer, if desired. No setup costs and no monthly fees.